We raise adorable puppies in a family home setting and around kids. I have been raising puppies over 20 years and enjoy every bit. We have full blooded puppies and mix breeds. All of out puppies come up to date on shots, wormed, and vet checked. We also offer a 1 year health guarantee to ensure on pups are healthy and loved when they are ready to go to their forever home. Evening and weekend appts available. We are breeders of the beautiful, loving furry little companion dog the Bichon frise. We raise all dogs parents and puppies in the house with us. We travel around the country with them in our motorhome. AKC Bichon Frise. Champion Bloodlines. I have a male Bichon, born 10/9/16. He will be ready just in time for Thanksgiving. Comes with first set of shots and wormed. I am asking $550.00. He is a hypoallergenic dog and will make a great addition to your family. You can call or text 267-658-4224. 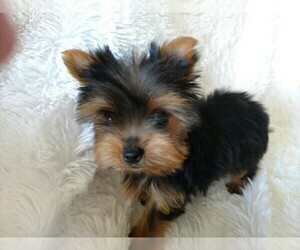 A $150.00 deposit will hold puppy. Looking for a reputable Bichon Frise breeder in your area? Simply browse through our nationwide directory of 1000s reputable Bichon Frise breeders - complete with website addresses, dog breed profiles, and current puppies for sale.